I’m recording this more to remind me than anything else. 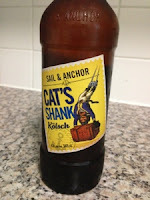 Remind me just how cynical a beer this is, purported to be a ‘craft beer’ yet made under contract on behalf of a supermarket backed liquor group, the label a cheeky revival of an old pub brew with the pub also now owned by said supermarket. In other words, this is just another supermarket own-brand beer that is ‘craft’ in marketing speak only. Correct. These beers are just commercial rot in my view. Just so bloody boring. You feel cheated buying them -as I did (despite being warned by the bloke in the First Choice store). And the "historical tales" written on the back label are dangerous. Many folk might even start thinking they're true! embroiled in a little while ago? I don't think so – this is one of ALH 's (Woolworth's pub arm) own establishments (hence they own the brand).